Tomorrow Hikashu will embark on the third (and last) tour of the year, heading for the west. See Live Schedule page for venues, directions et al. They will be back to Tokyo and perform at Kichijoji Star Pine's Cafe on November 4, as the tour's final. Also, it is planned that there is a special concert for the year's end. It will be held at Daikanyama Unit, Tokyo on December 26, and all the original members - Inoue Makoto, Yamashita Yasushi and Tobe Satoshi - will be united again. In December 2008, Hikashu with all the original members played at the very place, and that was utterly special, nearly 3-hours performance. Surely this time it will be a memorable evening as well. Regarding the upcoming releases, it is officially announced that the next reissue will be "Ningen No Kao" ["Human Faces"]. The band has already completed the remastering process. The release date is December 23. The album was originally released in 1988 and has been dropped from catalog for years so this is welcoming reissue. It would seem that "Fushigi o Mitsumete" ["Watching The Wonderment"] will be included in a compilation album of Japanese new-wave. The Makigami-Sakaide number was originally released as the lead track of the "Orguss 02" OST album in 1993. Unfortunately, the album is hard to find now and became very pricey. A live recording of the song was issued in "Hikashu History" but the original studio version will be chosen for the forementioned compilation. Makigami recently expressed that the OST album will be re-released in near future but there is no concrete plan for that. So maybe it is advisable to get the compilation, which is slated to be out at the end of the year. I will let you know when it is available. And new ones - it is likely that a new release from the band will be a 3-song EP. They are still working on it, and it would be out in December if everything went smooth. We can only wait and see. "Another World Of Hikashu" is a concert series which aim is to introduce various projects from the members to royal audience of the band. The fifth installment will be held next week, and this time the event features Kuro Yagi Shiro Yagi, an improvisational bass and drum duo from the band's rhythm section. The series usually brings in some guests. This time, saxophonist Umezu Kazutoki and actress Douguchi Yoriko are to make an appearance on the date. Umezu have performed with Hikashu many times in the past and Douguchi regularly plays with the Sakaide-Sato team in her uklele outfit, Paititi. Also, the duo is to organize an event in November. It is called "RIZM" and it features a guest, Emi Eleonola. Eleonola is known to be the front person of the band called Demi Semi Quaver, and she is just une chanteuse extraordinaire. Her singing style, which is to improvise interminably using made-up language, is something to see. Kuro Yagi Shiro Yagi presents "RIZM"
contains 40 tracks by Makigami Koichi, Kamijo Tsunehiko, Onuki Taeko, Yoshida Minako, Yano Akiko et al. The album is a compilation which consisted of the music used for various TV advertisement, produced by a company called ON Associates. ON Associates is a music publishing company which made a series of music which graced some of the ever-popular TV advertisement in Japan, like the first Sony Walkman ad in 1977, which is also included here. The album featured a collection of their representative works and many of the selection are not available elsewhere. It is noteworthy that it actually contains two tracks by Makigami, "Heisei Jaran Bushi" and "100 Nara Dekiru." "Heisei Jaran Bushi" was a commissioned piece for the TV advertisement of a travel magazine called Jaran (which is still in operation). It was also released on 3-inch CD single under Makgami's name in 1990, and has still been regularly featured on his Cho-Kayo recital. I don't confirmed for myself yet, but it is possible that the version on the compilation is edited. The advertisement itself was used to be available on YouTube for a long time but seems recently gone, unfortunately. "100 Nara Dekiru" was used for TV advertisement of a gas product called Idemitsu 100 Gasoline. The piece is available for the first time. Having never seen the advertisement myself, I cannot tell what it is like, but according to Makigami, on the advertisement, the song was buried in the mix and almost inaudible. So we could listen to it at last. If you are a collector, it is advisable you should get this one. Makigami recently expressed his intention for rereleasing "Heisei Jaran Bushi" but apparently the negotiation with the copyright holder was not fruitful. And it is unlikely that "100 Nara Dekiru" sees the light of day anytime soon again. The album is now available on HMV Japan. By the way, Makigami did a lot of TV advertisement thing, singing and narration, in the past. This one is for cold tablets, 1990. 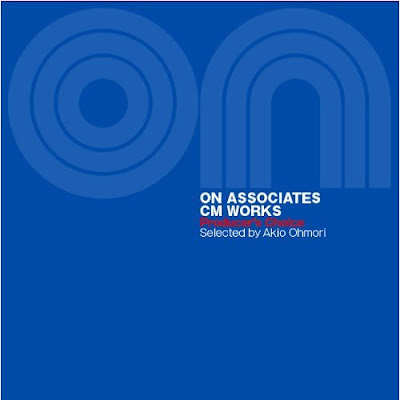 Although the album is credited as Makigami solo, it is actually the first effort of the group called AЯ. AЯ is a trio of Makigami, Bolot Bairyshev from Aitai (wikipedia), and Sato Masaharu on percussion and voice. It represents Алтай (Altai) and Япония (Japan). Also, in Russian alphabet, A is the first word and Я is the last. Makigami explained that the name of the trio also implies, to represent "everything between the two - everything between the beginning and the end". So what is the music like? I would like to describe it as "spacious," in a good sense. The music sounds like the wind through vast plain, and there is nothing plastic here. 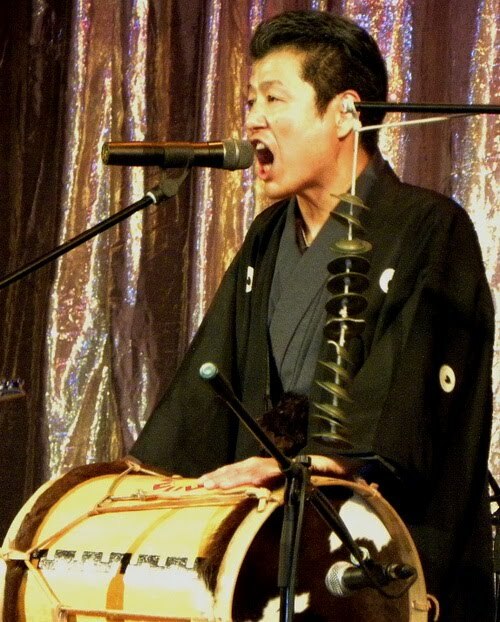 Although many instruments of traditional origin were used, this is not traditional music of any kind. 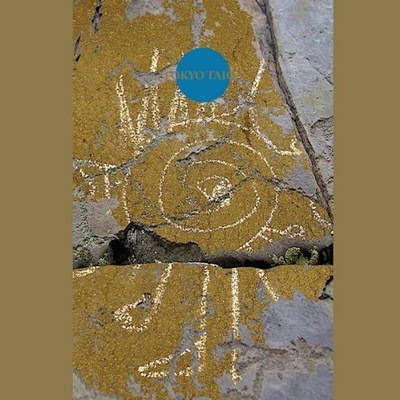 All the composition are original written by its members, and certainly it sounds contemporary. A partnership between Makigami and Bairyshev started in 1998. They happened to meet in a music festival in Austria and played together. They immediately hit it off, and the collaboration began. 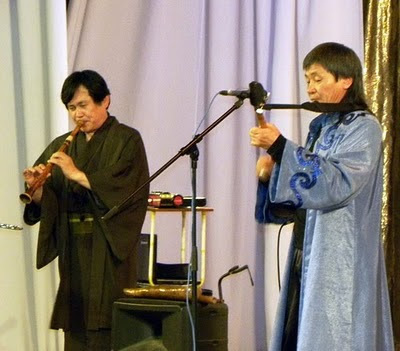 Bairyshev visited Japan in 2000 for the first time under the arrangement by Makigami, and since then he frequently came and performed in the country. In 2007 Sato joined the duo and AЯ was born. Recently the trio toured Japan in March and April. And this summer they have just completed a tour in Altai, including a concert date in Gorno-Altaysk, the capital city of the republic. There is a newspaper article in Altai reporting the trio's tour. Google translation is here. Recently the excerpt from a TV-program "Jam-Jam New-Wave '80" was uploaded at YouTube. It was recorded live on February 25, 1980 at Science Museum, Tokyo. Hikashu performed "At the End of the 20th Century" and then-unreleased "Shiroi Highway" (Unfortunately, Yamashita was invisible throughout the performance). After a short skit, Plastics followed, playing "Digital Watch" and "Delicious." The latter was mistakenly credited as "Top Agent Man." 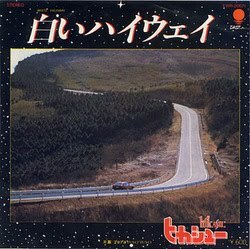 "Shiroi Highway" ["White Highway"] was Hikashu's 2nd single, backed with "Puyo Puyo," released in March 1980. It was also used for TV advertisement of in-car audio system of Clarion. The song has an interesting episode. Demanding a catchy tune for single, Toshiba-EMI immured Makigami and Mitama at a meeting room of the company's building. Struggling for a while, they squeezed out a tune, which was "Shiroi Highway". This Saturday Hikashu will perform at Yokohama Jazz Promenade. Their appearance of the jazz festival is second time. 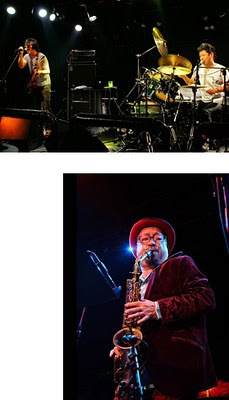 Last time in 2008, and it was realized upon the recommendation by the late Hiraoka Masaaki, a veteran jazz critic, and a long time supporter of the band. Hiraoka was born in Tokyo in 1941. Engaged in student activism, he dropped out the college (where he majored in Russian literature) and started writing. His first book, entitled "the Tatars Manifesto," was published in 1964. In 1968, he wrote a book "Jazz Manifesto" and went into jazz criticism. Being a charismatic figure , he also had been a high-profile individual as a new-left activist in 1970s. Basically he had been regarded as a music critic (mainly jazz) but he actually covered a vast genre of culture and show-business in general. In particular, he liked to treat so-called outpost artist and expression. Having been a prolific writer throughout his career, he authored over 120 books. His connection with Hikashu started in 1981. That year the band released the 3rd album, "Uwasa No Jinrui" [The Human Being]. 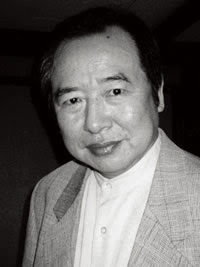 It was met with harsh criticism by Nakamura Toyo, an influential music critic. Hiraoka strongly disagreed with Nakamura's assertion and spoke very highly of the album. 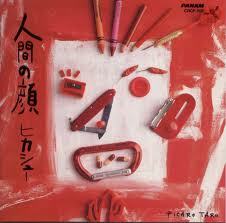 Shortly after that, Hiraoka formed a relationship with the band and even toured together in 1984. 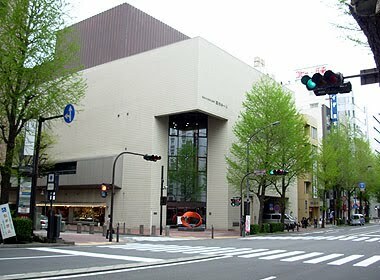 In 1990s he moved to Yokohama and engaged in various regional events including Yokohama Jazz Promenade. He passed away with cerebral infarction in 2009. I saw him in person once. 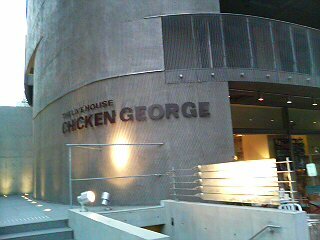 It was the Hikashu's set at Yokohama Jazz Promenade in 2008. He seated in the front row, with his wife, seeing the band performing with smile. He looked pretty contented. I will return to the same venue this weekend, and it will surely bring back the fond memories for me.